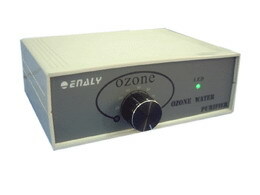 OZAC-100 aquarium ozone generators is with complete range (100mg/hr) variable ozone output for home aquariums. The feed gas must be dry and free from impurities. Use contact chamber, such as protein skimmer that its materials must be highly resistant or inert to ozone, to transfer ozone gas into water. Never inject ozone directly into the fish tank. The aquarium inhabitants should be protected from exposure to free ozone and /or oxidation products. The recommended method to remove any residual free ozone and any free oxidation products is by vigorous aeration followed by filtration through activated carbon. The best method to monitor ozone input is by measuring the oxidation-reduction potential (ORP) with probes or by a Redox meter/controller . Redox potential values of between 300 and 350 mV are recommended as the desirable level. Do not let the redox value of the aquarium water exceed 400 mV as harmful substances (commonly in the form of hypochloric and hypobromic acids) can be produced, which could damage sensitive organisms. Ozonized air should be prevented from escaping into the room; it is advisable to install a carbon filter on your protein skimmer or ozone reactor where ozonized air escapes.